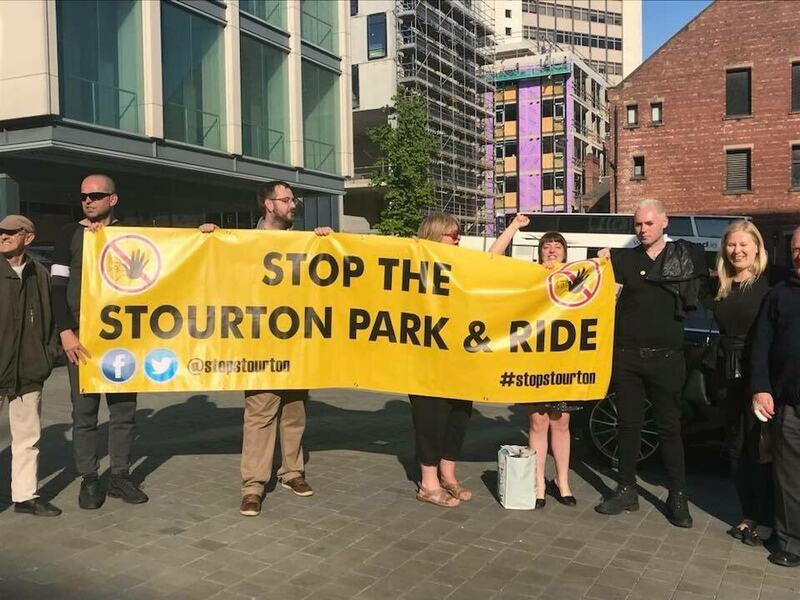 Residents from across LS10 gathered last Thursday (23 August 2018) for a heated public meeting about the controversial Park and Ride scheme proposed for Stourton. The project is a flagship element of the Council’s push to reduce congestion and improve air quality in the city – but a vigorous local campaign has emerged this year, challenging the scheme on many points (see previous article). At the packed-out, all-age meeting in Hunslet Carr, attendees heard that the campaigners had already won several amendments and concessions – but that they would keep fighting until the scheme was wholly scrapped. A recurring complaint was the limited local consultation. Campaigners reported from their door-to-door outreach that most people knew almost nothing if anything about the plans – and both councillors and Council officers have admitted that their official consultation programme was lacking. One resident (Mark) insisted: “It screams of the Council trying to avoid scrutiny by local people”. And one of the guest speakers – Frank Dignan (a lawyer, and former Middleton councillor) – stressed that local government are legally obliged to consult with local communities, and follow rigorous planning procedures; and that if these had been flaunted, a judicial review might easily overturn the plans. Another guest speaker was environmental consultant John Moorhouse, who insisted that an Environmental Impact Assessment was urgently needed – and urged residents “not to let the Council get away with basic reports and generalisations”, but scrutinise the details, as the scheme might well cause illegally high emissions locally. The campaign team also reported that they had met “disdain” and uncooperation from elected councillors. Despite invitations, only Cllr Paul Wray (Hunslet and Riverside) attended. In the midst of intense questioning, he repeatedly stressed he was there to listen and would pass on feedback, that the scheme was far from signed-off, and that – if it did go ahead – it would make a significant and positive impact in the city, if not for everyone. Challenge after challenge, passionately yet clearly articulated, flowed from the floor. “I’ve seen the Council vandalising the city over decades, and this is just more of the same” (Brian). “I get that the scheme is to make things better for Leeds, but it definitely won’t make things better for us” (Carla). The debate also touched upon the recent decision to exclude south Leeds from the Clean Air Zone: “You (the Council) are sacrificing people in south Leeds” (Rob). And another concern was the fear that the scheme – once built – would be expanded, as has happened at Elland Road. Martin, a Labour member, relayed that he’d attended a party meeting at which there was talk of later extending the carpark to take 3000 cars. For official information on the scheme, visit www.wymetro.com. For more on the SPARS campaign, visit www.twitter.com/stopstourton or www.facebook.com/stopstourton.